Your fingers sweat 24 hours a day 7 days a week. Not only do we have 1000’s of sweat glands on our fingers, we also have sebaceous glands that secrete an oily substance. The combination of these 2 secretions makes our fingers and hands quite slippery. One of the things that we have learned from forensic science is that these secretions are always there. We leave these secretions behind on almost every object that we touch as a fingerprint. There are many conditions that make this slippery problem worse. If you’re the least bit nervous, or excited, the stress activates the sweat glands, to produce more of this slippery solution. If you have a tendency to perspire. If you’re golfing in a state where the humidity is high. What this means, of course, is that if you hold your club with your bare hands, or even wearing a glove, it is almost impossible to have your best grip. Our foreheads are loaded with sebaceous glands, those same glands we talked about in the beginning of this article. Whenever you touch your forehead, you transfer this oily substance to your hands and then having the optimal grip becomes even more of a challenge. All of us have about 3000 sensory nerve receptors on each fingertip that send an incredible amount of information to our brain. Many of these nerves act like miniature motion detectors. If they detect even the slightest movement of an object you are holding, they will instantly alert your brain. Our brain, in turn, deciphers this information and tells our muscles how hard to grip the club. Since this all happens at the subconscious level, we are not the least bit aware that this is happening. Wouldn’t wearing a glove take care of this issue? You would think so, but here is another problem we haven’t discussed yet. Our palms (and soles of our feet) have more sweat glands per square inch than any other part of the body. So with all this oily, sweaty solution produced by the palms and the fingers, the inside of the glove gets wet and slippery. Once again the brain senses this slipping and sends the message to your muscles to grip tighter. So, let’s consider how this affects your golf swing. You’re preparing to drive the ball, you’ve got the club head in a perfect position, you’ve got exactly the right grip pressure and you end up “SLICING THE BALL”. What happened? According to Hank Haney (video below) 90% of us slice the ball and it is usually from too much grip pressure. So why would you have to much grip pressure when your grip was perfect when you initiated your swing? As the club head moves through the air the centrifugal forces generated try to pull the club out of your hands. The sensory nerves in your fingertips detect movement and your brain sends signals to your muscles to tighten your grip and since your hands had some sweat and oils on them already, your subconscious brain made your muscles grip even harder. HOW does GRIP PRESSURE affect how far we can DRIVE the ball? Most of us want to be able to drive the ball as far as we possibly can. We also know that if our grip is too tight, we’ll have a tendency to swing with our hands and arms instead of the big muscles in our lower body. Of course, if you just swing with your hands and arms, you won’t get the distance you are capable of. So, how can we loosen our grip and allow our powerful trunk muscles to be involved in our swing? First we have to convince our subconscious brain to lighten up and not force us to grip so hard? Most of us would agree that the Professional Long Drivers know most of the secrets on how to drive the ball as far as they possibly can. See what they say about Gorilla Gold. According to Mo Skelton ( physical therapist and founder of F.A.S.T. sports performance ) in his 5/13/14 article for yahoo sports – “when we grip harder to maintain control , it actually increases tension in the muscles of the arm and shoulder up to the rotator cuff putting players at greater risk of injury”. THE 2 MOST IMPORTANT THINGS TO DO TO SOLVE THESE PROBLEMS. Absorbs the sweat and oil – Gorilla Gold is delivered on a cotton cloth that is impregnated with a specially formulated waxy compound. The cloth is fabricated to absorb sweat and oil before leaving behind a light tacky feel. Waterproofs the surface you apply it to – A light coating of our Gorilla Gold formula is left behind on any surface you apply it to; hands, grips or gloves. This coating inhibits the formation of new sweat or oil on your hands and waterproofs any surface it is applied to. Makes your grip better – This tacky, waxy coating instantly enhances your grip, providing total confidence and you can completely control the amount of enhancement you want simply by squeezing the Gorilla Gold cloth more firmly and using it more frequently. Gorilla Gold is the only grip enhancer that so easily and effectively delivers this option. 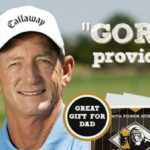 Used by many top touring pros and professional long drivers – Many years ago we approached one of the premiere golf coaches in the world, Hank Haney, to get his opinion on our product, GORILLA GOLD. He immediately recognized it’s importance and we feel very lucky to have received his endorsement. Conforms to the USGA under the rules of golf. You don’t have to clean it off. It doesn’t damage gloves or grips. 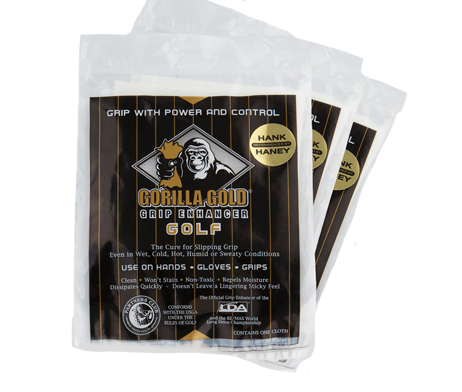 In fact GORILLA GOLD helps keep your grips clean and it naturally dissipates from your hands, grips or gloves so there is never a gunky build up. It was in Cleveland, Ohio, I think. It may have been Columbus. Or possibly even Detroit. I know it was January of 2009. In those day, my partners Pat and Tom Dugan and I traveled to a lot of consumer golf shows. For several years – from early January until mid-March, we traveled nearly every weekend. Since most of the shows were in the East, it was never an easy trip from our homes in Idaho and Oregon. But one Friday in some very cold place, our paths crossed one of the greatest golf instructors ever. My partners and I had spoken many times about how great it would be to have an instructor take Gorilla Gold’s message of better control with less grip pressure. We knew that a few of the top pros were using our product, but instructors, we reasoned, knew better than most the importance of grip in golf. Not in our wildest imaginings, did envisioned that the swing coach of the world’s top player; a teacher who was listed by Golf Digest’s as the #2 instructor in the world, would become that messenger. Hank Haney was the featured speaker at a show that was attended by thousands of already winter-weary golfers who needed to get a scent of what they’d missed since fall. At the time, Hank was Tiger Wood’s swing coach. As sponsor of the stage upon which he’d speak, Gorilla Gold was granted a meeting with him. “Tell me about this,” Hank said after arriving at our 10×10 booth and shaking hands. I won’t repeat what he said next, but it related to how it would have made a difference in one player’s performance at a past, very wet major championship. Later, we made a more formal agreement with Hank, and so you’ll see “Recommended by Hank Haney” on our Gorilla Gold Golf packages, as well as his image on our counter boxes. We’re a long way from finding a home in every golfer’s bag, but with Hank on our team, we move a little bit closer every single day. My name is Andrew Cohn, and I love golf. I’ve been playing for more than 35 years. I have always looked for ways to improve. When I was fourteen years old, I had just made my freshman golf team. I went out for a practice round with my mother. It was a very hot, humid Chicago summer day. Playing with my mom, she made sure I added more sunscreen and bug spray when we made the turn. An interesting thing happened to my grip with the residue from the sunscreen plus bug spray mix. My hands and my golf club grips got stickier. With that increased tackiness on my grips, I found I had more feel on my shots around the green. I had gotten up and down only once on the front nine. On the back nine, I was able to go improve my chipping and short shots to where I went up and down five times. This improved feel translated to really improved performance around the greens. Keep in mind, that at fourteen, I wasn’t hitting the ball all that far. Wooden drivers, the Titleist blades that I had to have, and the belief that I had to swing really fast, didn’t help me much either. So this improvement in my short shots, really improved my game — that day! The next time out, I did not repeat the success. At the time, I had no idea that the extra tackiness in my grip translated into less grip pressure caused my better feel and better short game results. Even if I had known the cause, I probably could not repeat that perfect mix to duplicate the tackiness. Did it wash off? Was it even good for me? I had no way to do it again. Then I discovered Gorilla Gold® Golf Grip cloths. I tried one, and I had the same tackiness I found that great day in 1978. The great time with my mom, and the great results that improved my short game. Since I started using Gorilla Gold® Golf Grip cloths, my handicap index has dropped from 16.8 to 8.3. I don’t know if Gorilla Gold® Golf Grip cloths will help you cut your handicap in half like I did. It could be that one ingredient you need to help improve your golf game past your current game. Hank says,”The single most important aspect of grip pressure is that it stays the same throughout the swing. One of the biggest destroyers of the golf swing is an increase in grip pressure at the start of the downswing. When this happens it is virtually impossible to swing the clubhead on the correct path with the correct face angle. If anything the grip pressure should lighten slightly on the downswing to help us fully release the club. Admittedly, I’ve gone ape over Gorilla Gold, a $5 towel that adds tackiness to your grips. At the national golf writers’ tournament, it poured so hard that by the second tee, my rain gloves were too saturated to be effective. In desperation, I dug into my bag for this USGA-approved towel. It’s coated with a nontoxic sticky substance — like pine tar but without the mess, as the company says. Just rub it on your grips and gloves as needed. The three-pars, one-birdie start at Mid Pines Inn & Golf Club had me in contention, and I could swing as if it were a regular day. Though the tournament director called play, I kept going. Unlike everyone else, I could still hold onto a club. No question, this accessory is better than an umbrella.